Under the natural protection of the impressive cape known as the Punta de Moraira is an exceptionally pretty town between Javea and Calpe. 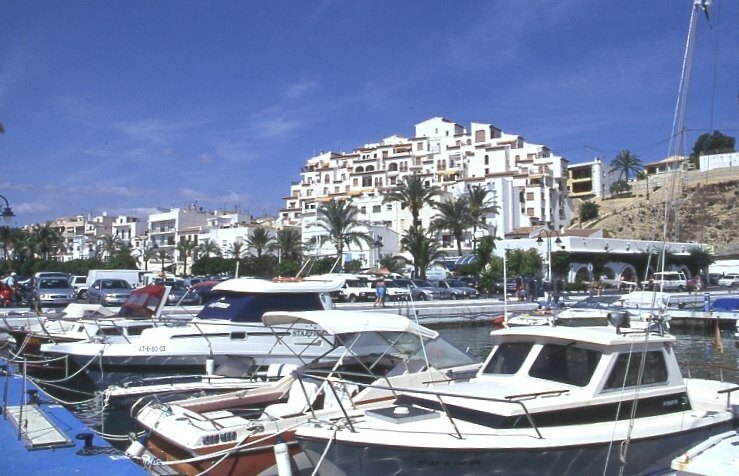 Once a small fishing village Moraira is developing into an exclusive and charming town much favoured by both holiday makers and those wishing to buy a permanent or semi-permanent residence on the Costa Blanca. Careful town planning regulations have ensured that Moraira has not lost it's Mediterranean charm to over development as it is renowned for it's secluded coves and bays, whilst one can still experience an extremely attractive beach, numerous bars and restaurants, and luscious green vegetation. The superb marina here is the centre of social and sporting activities in this town and is the venue for the "Cruisers Championship". Due to the cosmopolitan nature of the town Moraira also benefits from a large selection of quality restaurants offering delightful cuisines from many different nations. Calpe is a lovely sunny resort at the southern end of the northern Costa Blanca. It boasts two fabulous long sandy beaches extending out along curved bays from either side of the famous Peñon de Ifach. 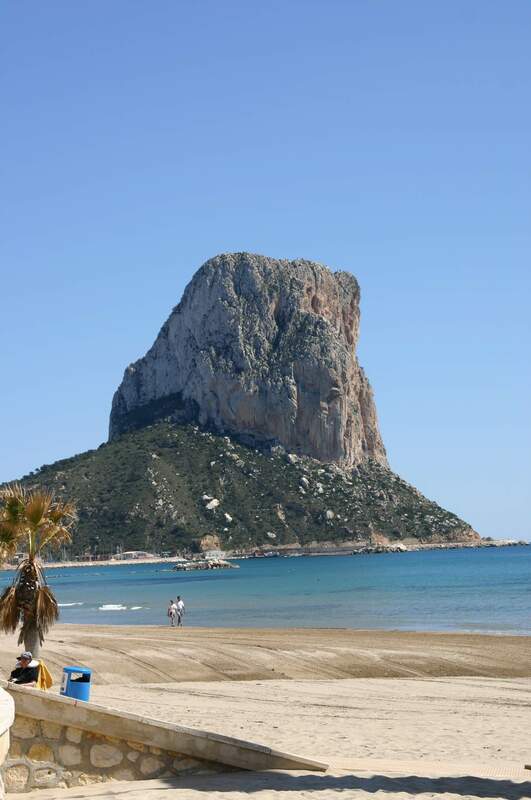 This is an enormous rock that has become the symbol of Calpe and a famous landmark on the Costa Blanca. The seafront promenade is lined by hotels and apartment blocks while low-rise residential complexes and villas lie on the gently sloping hills surrounding the town. There is a yachting marina and a fishing port where you can sample the day's catch at one of the many seafood restaurants opposite the port. Calpe also has a charming old town with a Moorish quarter, narrow streets and castle ruins. In the thirties writers such as Hemingway spent their summers in Calpe. Calpe's first hotel was established next to the Peñón Rock: the Ifach Parador. The Morro del Toix and the Peñón de Ifach mark the extremities of Calpe's bay. The Peñón de Ifach (Ifach means north in Phoenician) is the symbol of Calpe and, by extension, of the Costa Blanca. It is the highest rock in the entire Mediterranean and divides Calpe's shoreline in two. The limestone mass is 332 metres high and penetrates 1 kilometre into the sea, forming a first-rate geological feature. Since 1987, a Natural Park has preserved its unique ecological treasures such as the Ifach carnation. The summit of the rock can be visited in organized groups and in the Nature Auditorium the rich fauna and flora of the park is explained. There is also one of the best views of the Costa Blanca from the top of the rock. Prehistoric, Iberian, Phoenician and Roman remains have been found immediately next to the Peñón and on the isthmus which links it to the coast. At the foot of the Peñón are the 'Baños de la Reina' (literally, The Queen's Baths) that, in reality, was the site of a Roman 'factory' for the drying and salting of fish. The Peñón was also an extremely good watchtower for the people that lived at its base. The Morro de Toix was another place used to watch over the Barranc del Mascarat, which provided access to the coast. 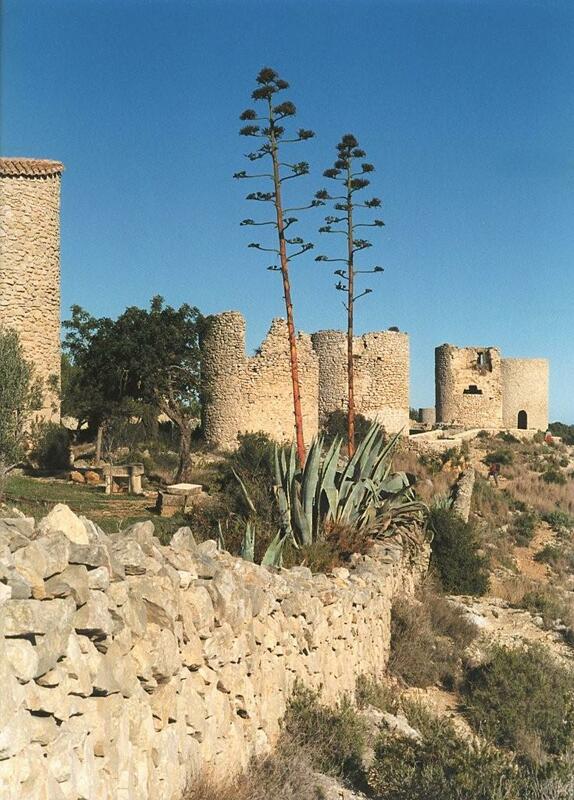 During the course of the centuries, the village retreated more inland for greater protection and, following an attack by pirates, protective walls were built around the village in the 15th century. The only sections of these walls remaining are the Peça Tower next to which is found the only church built in a Mudejar-Gothic style in the entire Valencian Region. Between Les Bassetes and the Morro de Toix Calpe there are 11 kilometres of sandy beaches - for instance the Levante and Arenal beaches - and coves like the one at La Manzanera where there are three buildings designed by Ricardo Bofill, and the Les Urques cove where scuba diving and fishing are possible. The Cueva dels Coloms, in the Morro de Toix, which faces towards Altea, is a freshwater cave that is only accessible from the sea. The nature of Calpe can be appreciated through nautical excursions and walks. The Peñón de Ifach is renowned by climbers for its difficulties and unique features, and it can be climbed by a number of routes of varying difficulty. Potholing is possible on the steep banks and peaks of the Monte Oltá and the Barranc del Mascarat. Calpe's attractions have made the village a tourist destination of note for both national and international visitors, who live together all year round in peace and harmony. Javea is another lively town swathed in history. It is at the end of a gentle winding slope from the imposing Montgo mountain, and has a bustling, energetic beachfront. Here you will find a whole variety of watersports including windsurfing, scuba diving, water skiing, fishing and sailing. The sandy Arenal beach is very popular and the promenade is lined with numerous beach cafes and restaurants from where you can sit and watch the world go by. The 25 kilometre long Javea coastline also has many small coves such as the lovely Granadella beach perfect for diving, or the Ambolo naturist beach. As in Denia, there is an historic town centre with narrow streets that contains an archaeology and ethnology museum, which vividly illustrates the town's exciting past. Javea, the most easterly point of Spain, has two lighthouses positioned on the headlands of Cabo de San Antonio and Cabo de la Nao from where there are breathtaking views of the sea and coastline. The main residential areas are situated in the areas of Costa Nova and Cabo de la Nao and also at the foot of the Montgo. 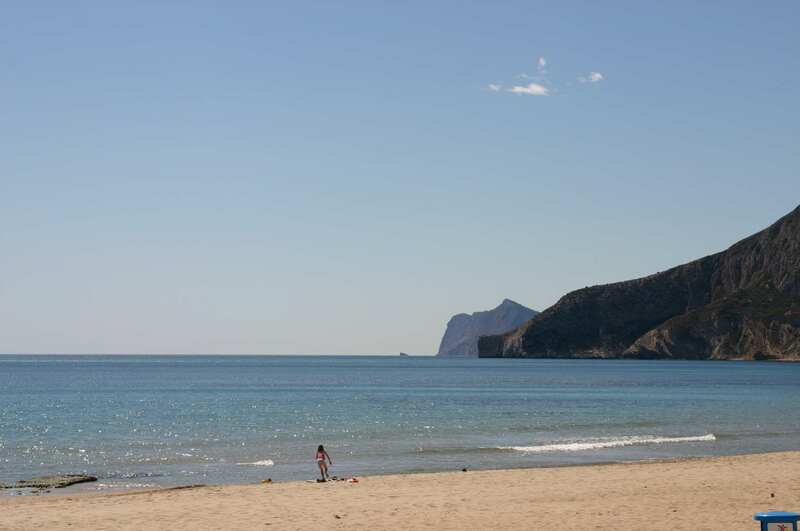 The World Health Organisation has awarded Javea the prestigious "Clean Beach" award.